House and Senate lawmakers reached an agreement Thursday to finalize the overall state budget, including $160.5 million for the Hawaii State Hospital, $17 million for Hawaiian Home Lands and $81 million to more aggressively pay down unfunded liabilities for health benefits promised to public workers. Civil Beat. State lawmakers have wrapped up negotiations on a $13.7 billion budget for the coming year that includes a financial bailout for Wahiawa General Hospital and $160 million to rebuild much of the Hawaii State Hospital for the mentally ill. Star-Advertiser. Hawaii state lawmakers have approved a state budget that includes $2.5 million for the Wahiawa General Hospital and another $700,000 for the Wahiawa Center for Community Health. Pacific Business News. Hawaii state lawmakers have agreed to set aside nearly $62 million of this year’s budget to subsidize the construction of rental housing units and $35 million to repair aging public housing units. 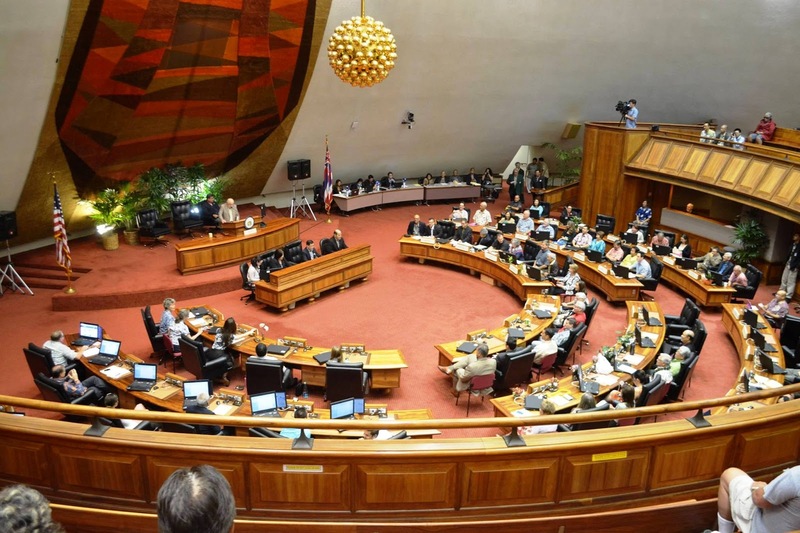 But Sen. Jill Tokuda and Rep. Sylvia Luke, who lead each chamber’s money committees, said they don’t plan to hold a hearing for a proposal to increase a tax credit for renters, even though Hawaii renters are among the most cost-burdened in the nation. Civil Beat. Despite a last-minute legal demand to delay the announcement, Hawaii’s Department of Health plans on Friday to announce the eight companies that will receive licenses to grow and sell medical marijuana. Civil Beat. After Hawaii sought bids last month for a lucrative new contract to house hundreds of its prisoners on the mainland, no rivals stepped up to challenge the state’s current contractor. The Hawaii Department of Public Safety announced Thursday that Nashville, Tennessee-based Corrections Corporation of America, the largest for-profit prison company in the country, was the sole bidder for the contract. Civil Beat. State lawmakers are looking to make Hawaii one of only a few states that allow psychologists to prescribe medication in an effort to increase access to mental health services. Associated Press. Hawaii has the highest rate of residents using solar panels in the nation, and lawmakers want to extend the state’s leadership role by offering incentives or rebates to those who buy batteries to store their renewable energy. Associated Press. The head of the Native Hawaiian Education Council and an insurance company executive are among five nominees being considered for positions on the Hawaii State Public Charter School Commission. Civil Beat. Honolulu’s chief of police, Louis Kealoha, and his wife Katherine, a deputy prosecutor, are firing back at the city ethics commission, saying they’ve been unfairly targeted for years. They also say they’re not the only ones, so they’ve filed a federal civil rights complaint. KHON2. Honolulu Police Chief Louis Kealoha and his wife, Katherine Kealoha, took to the television Wednesday to proclaim their innocence in a wide-ranging federal grand jury investigation that involves allegations of corruption and abuse of power. Civil Beat. A bill that would create more incentive for homeowners to apply for second dwellings on a property got a preliminary approval from the City Council Zoning and Planning Committee on Thursday. Star-Advertiser. So far this year, there have been eight pedestrians killed on O‘ahu’s roads. Advocates say one solution includes revamping streets to make them safer for all users, whether on bike, car or foot. Hawaii Public Radio. Honolulu has a new claim to fame. It has the most expensive cost of bread in the world, according to expatistan.com. Pacific Business News. As rail construction makes its way to the city, small businesses owners in Kalihi are bracing themselves. Pre-construction has already begun along Dillingham Boulevard and major construction is set to begin sometime between 2017 and 2018. Hawaii News Now. The battle of the budget is officially over, with House and Senate committees agreeing Thursday on the 2016-17 supplemental funding bill. Here’s how West Hawaii fared. West Hawaii Today. The parents of Peter Kema Jr., aka “Peter Boy,” are in police custody and have been charged with his murder. Peter Kema Sr., 45, was arrested at 5:31 p.m. Thursday and charged with second-degree murder for the 1997 death of his 6-year-old son. Kema was already in custody at the police cellblock, having been arrested earlier in the afternoon on a charge of driving without a license. Tribune-Herald. The 19-year-old disappearance of a 6-year-old Big Island boy, who would have turned 25 on Sunday had he lived, will finally be adjudicated. Star-Advertiser. Around 15 people testified against tuition increases at a roughly two-hour meeting, which was one of 11 held statewide this spring to gather feedback before regents convene next month to make revisions. A second meeting was held at UH-Hilo later in the day. Tribune-Herald. Big Island Invasive Species Committee collaborates with retail giant to remove night-blooming jasmine and medinilla from garden centers in Hawaii. Big Island Video News. On Thursday, House Bill 2501 HD2 SD 2 CD1, or the Maui water rights bill, was approved. The bill allows Alexander & Baldwin Inc. to continue a previously authorized disposition of water rights for three years or until its pending application for water rights is resolved, whichever occurs sooner. KITV4. The House on Thursday passed a controversial bill that would allow Alexander & Baldwin to retain the rights to the water flowing through dozens of streams in East Maui while administrative and legal challenges to its request for a long-term lease for water are resolved. Star-Advertiser. The House voted Thursday evening to approve a bill that lets Alexander & Baldwin continue leasing stream water from East Maui, to divert to farmland in Central Maui, where the last sugar mill in Hawaii is soon to close. That sets up House Bill 2501 for its final vote in the Senate on Tuesday. If passed, the bill would then head to Gov. David Ige for his signature. Civil Beat. Alexander & Baldwin Properties' new residential community in north Kihei is accepting applications for its first neighborhood, which includes up to 170 condominium homes. Maui News. The Kalalau Valley is world renown for its majestic scenery and breathtaking wilderness. Because of that, it’s a nest of illegal camping activity and ground zero for periodic enforcement sweeps by the Department of Land and Natural Resources’ Division of Conservation and Resources Enforcement. Garden Island. A 19-year-old Eleele man was arrested Thursday in connection with an attack on a Hawaiian monk seal at a Kauai beach. Star-Advertiser. Shylo Akuna was picked up by Department of Land and Natural Resources DOCARE and NOAA Office of Law Enforcement special agents around 2:30 p.m., just two days after a video showing a man harassing a well-known Kauai monk seal named RK30 began circulating the internet. Garden Island. The trial for the Kauai police officer charged with negligent homicide for allegedly causing the death of a 19-year-old man on Kaumalii Highway has been moved to October. Garden Island.